Over the years I’ve been very pleased with the charger. It actually did revive some older batteries that weren’t operating properly with the original charger and I believe it’s maintained the health of newer batteries that I’ve purchased since then. The features are very good – it’s nice to see the readout of the charging status so I can actually know if the battery is good instead of just relying on the color of a single LED. The kit also comes with a case and some C and D size adapters, though I have yet to use any of those. I use the charger on a regular basis and I haven’t experienced any issues with it yet. This particular charger only works with AA and AAA batteries, which isn’t much of an issue in our house. 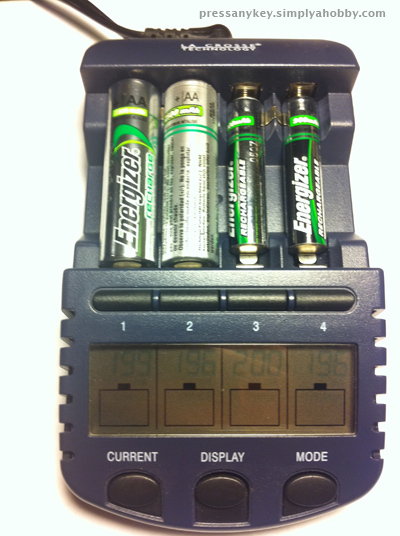 We have very few devices that use C, D, or 9V batteries. It doesn’t get hot like my old charger and the power management is very good – I don’t have to worry if the charger will overcharge the batteries and start a fire. It stops charging the batteries once they are full. Another reason I decided to post this information is because I just ordered 16 AA and 4 AAA Sanyo eneloop batteries, which I’ll be using with this charger. Since I’ve only had a handful of rechargeable batteries I’ve been a bit stingy about how they’ve been used. This new order should put an end to that and hopefully provide us with enough batteries to use for whatever we need. The up-front cost may seem a bit high (about $50 for all of those batteries) but they should pay for themselves within the first year or two of use.